Salo, L.; Frontera, T.; Goula, X.; Pujades, L.G. ; Ledesma, A. On 24 September 2013, an Ml 3.6 earthquake struck in the Gulf of Valencia (Spain) near the Mediterranean coast of Castelló, roughly 1 week after gas injections conducted in the area to develop underground gas storage had been halted. The event, felt by the nearby population, led to a sequence build-up of felt events which reached a maximum of Ml 4.3 on 2 October. Here, we study the role of static stress transfer as an earthquake-triggering mechanism during the main phase of the sequence, as expressed by the eight felt events. By means of the Coulomb failure function, cumulative static stress changes are quantified on fault planes derived from focal mechanism solutions (which act as both source and receiver faults) and on the previously mapped structures in the area (acting only as stress receivers in our modeling). Results suggest that static stress transfer played a destabilizing role and point towards an SE-dipping structure underlying the reservoir (or various with analogous geometry) that was most likely activated during the sequence. One of the previously mapped faults could be geometrically compatible, yet our study supports deeper sources. Based on this approach, the influence of the main events in the occurrence of future and potentially damaging earthquakes in the area would not be significant. 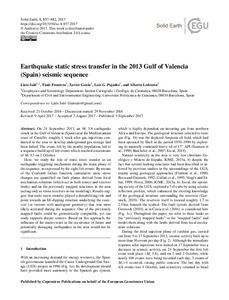 Salo, L., Frontera, T., Goula, X., Pujades, L.G., Ledesma, A. Earthquake static stress transfer in the 2013 Gulf of Valencia (Spain) seismic sequence. "Solid Earth", 5 Setembre 2017, vol. 8, p. 857.